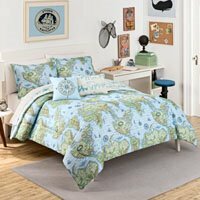 Waverly Kids Bedding Comforter Sets, Sheets and Throw Pillows by Waverly | P.C. Fallon Co.
Waverly Kids bedding offers stylish designs, vibrant colors and on-trend looks with the same designer attention to detail you've come to expect from Waverly. Shop new patterns in whimsical, charming designs perfect for creating a dreamy space for your child's room. Completing a finished look is so easy with lovely Waverly accessories such as throw pillows. Don't miss the coordinating sheet sets!